The Hereford Vintage Auctions sales are thrice yearly gentlemanly affairs held in the atmospheric, if rather cramped, surroundings of How Caple Court, in, you've guessed it, Herefordshire. The big excitement for me in the Spring sale was the ex Hamish Moffatt Scott 2 speeder. Hamish Moffatt was a larger than life character in the vintage sportscar and aviation world. His Telegraph obituary notes his 1952 drive to Cape Town in a 1923 Lagonda 12hp taking just six weeks to drive down the West Coast of Africa and escapades in a Tiger Moth which resulted in stern words and fines from the Civil Aviation Authority. 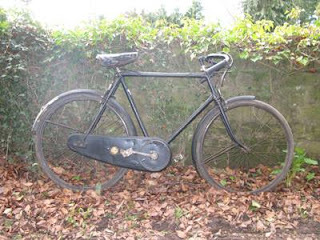 The Scott had been in his hands for several decades and on the face of it was in very tidy unrestored condition. A closer examination revealed a few updates and re-finished bits and pieces here and there but overall it was a fine 90 odd year old motorcycle. In with the car lots were a few treasures; the wonderful LSD tricycle fitted with a JAP v-twin engine needing light attention and the truly bizarre Carden cyclecar. The Carden was a two stroke parallel twin of slightly sub one litre capacity. The barrels are entirely separate from each other and sit facing forwards either side of the drive in the centre of the rear axle (no differential). It is a design which with hindsight it is rather difficult to see the logic behind, particularly if you are unfortunate enough to occupy one of the rear seats which are both located directly above an air cooled cylinder. 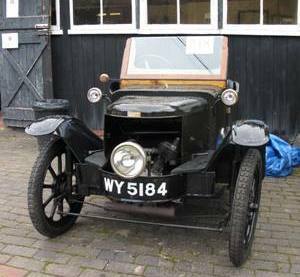 The Carden was a cousin of the equally wonky Tamplin cyclecar. As seems to be the case at all vintage vehicle auctions at the moment bidding was keen from the off. The Red Devil Motors equipe had a lucky bidding session with the Sunbeam bicycle and on paying up discovered that it came with a second, still to be identified, but probably Sunbeam, twenties sports machine for spares. 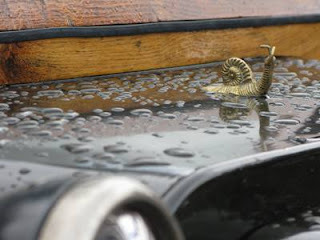 The Scott had been attracting strong interest all day and with the Triumph coming up first and a space in the stable for a useable flat tank a late bid brought the hammer down on our side. Having given up hope on the Scott I didn't really want to see it go within my meagre budget. I wasn't disappointed as there were already bids left that were some four thousand over estimate and it began at around ten thousand. All the action was on the telephone and folks on the bidding floor did little but remain slack jawed as it crept up in price to be hammered down at £11,300. The Red Hunter also brought in strong money though remained reasonable against the undoubted cost of getting it into such an immaculate condition. The humble Monet Goyon however was in the reach of most pockets at £90! 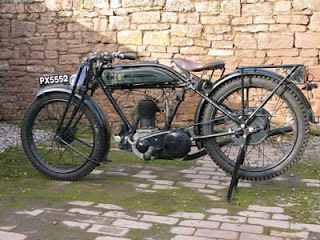 1927 Triumph Model N finds a new home! 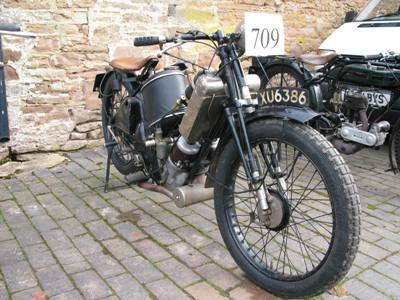 The LSD three wheeler failed to sell at £7,600 which didn't seem to bad a price for it... granted the performance would be woeful but try finding a JAP twin engined bike for less than five figures. Interest in the Carden was also fair but though it hit its lower estimate it failed to sell. A bit cheeky but probably reflecting the fact that HVA charge only a reasonable £50 to enter a vehicle into the sale and don't tap sellers for commision on top. At that price I guess some owners just think it worth a punt to see if they can get the big money! There's a place not far from home where you can post a tenner into an honesty box and play for as long as your heart desires with your trials bike. It's really just a field with a hump and a few trees in it. Probably not too challenging for the more experienced GasGas pilot but in places it is far beyond my abilities on my rigid framed Royal Enfield clunker. 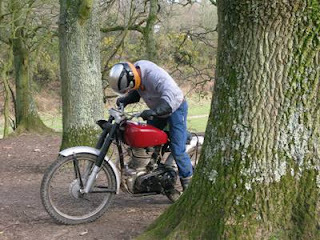 A sunny day beckoned and Dan heroically rode his '51 BSA Bantam trials over whilst I put the unregistered Enfield into the back of the van and travelled the lazy way. I bought the Enfield a few years back. An unexpected ebay buy; I was travelling around Africa on another old Enfield and was sitting in an internet cafe in Burkina Faso killing time waiting for my visa to Mali to be processed. I saw a scruffy girder forked Enfield trials bike at what I thought was a steal. I threw in a bid I knew wouldn't win and when I looked again four days later I saw that I had bought another bike. It was a good month before I was home and able to pick up. 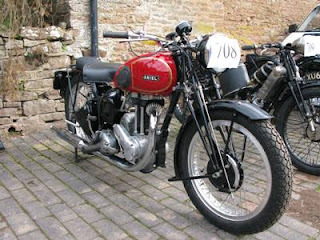 The attraction of the bike had been the rocking horse poo rare all alloy pre-war top end. The guy who had built it in the eighties lived in Redditch and had built it up with plenty of know how. There was no doubt it had been built with form over function displaying some agricultural cut and shut welding on the frame and a very uniquely angular exhaust system. But riding it proved that Terry the builder had known what he was doing. 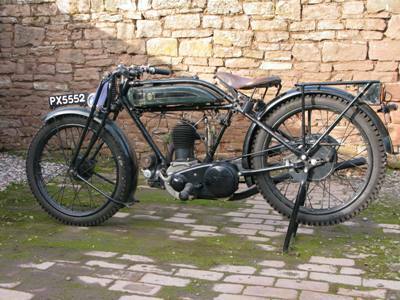 Indeed when he had campaigned it in competition it had been a very successful bike in the rigid / girder class. Shortly after buying I entered the trial at the VMCC Festival of 1000 Bikes. I had a hoot and came second in class (there were only two of us) despite not even finishing the trial. I found riding with the girders tricky to say the least, I suspected the geometry of the pivot points was wrong (though it obviously hadn't impeded the previous owner), so decided to fit a pair of tele forks from an Indian Enfield. The teles actually do improve looks substantially too and whilst I was making cosmetic improvements I fitted a more suitable petrol tank from a pre-war Model C and a nice upswept exhaust system. The Enfield's inlet tract has been lengthened, a smaller concentric carb fitted and the exhaust port is significantly narrowed. The tune is obviously just right as the pulling power of the motor is a revelation. It will pick up uphill from a tick over and has characteristics that flatter even my poor off road abilities. The frame is shortened and raised and the geomoetry seems as good as it will get for a rigid off roader. The alloy barrel and head save a good few pounds but having to pick up the beast after dropping it still reminds that it is a fair old sized lump of metal. 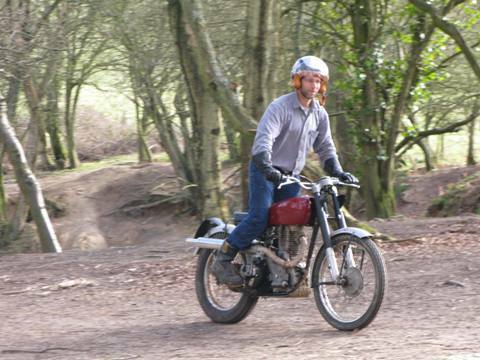 Swapping over to Dan's original trials Bantam is to experience motorcycling chalk and cheese. The bike is all correct factory spec with the exception of the lack of lights and lowered gearing. It's got a Rex Caunt cdi ignition so starting is easy and the immediate impression is of light weight and diminutive size. Standing at six foot three and having just stepped off the Enfield the Bantam feels toy-like. The riding position is set up for Dan's preferences and the bars are a little low for me but it's cheeky nature adds up to a fun ride. 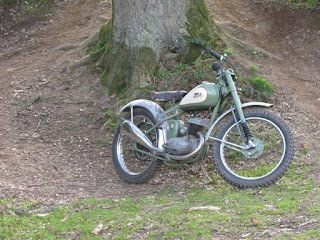 Whereas the Enfield will plod along the smaller engined two stroke needs to be pointed at an obstacle and given some revs and commitment. The Bantam's decompressor needs to be used descending steep slopes and lets out an amusing whiny whiffling noise. The original forks are decidedly choppy but the handling is fine. For modern style vintage trials the Enfield is evidently the more capable bike but it's easy to see that the Bantam is the proto scurrying mammal to the Enfields diplodocus and a few years development on two strokes would see the tables dramatically turned.